Your Birth Chart Portrait is an Artistic Planetary Snapshot at the time, date & place of your birth. Most of us are familiar with our star sign represented by the sun in a particular sign when we were born. But your Natal Moon sign tells about your emotions and your natal Venus talks about your pleasures and what you do to attract love and what you most value to relate. 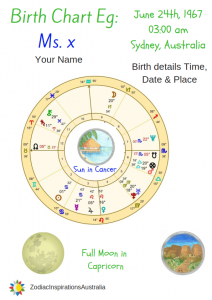 Included with your Birth Chart Portrait is an astrological message from your natal Moon. 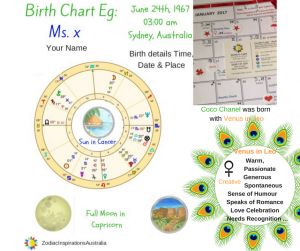 The zodiac sign, its moon phase and where it lives on your birth chart as well as your Natal Venus energy to connect with your feminine nature. We also suggest the best dates to pamper yourself each month.